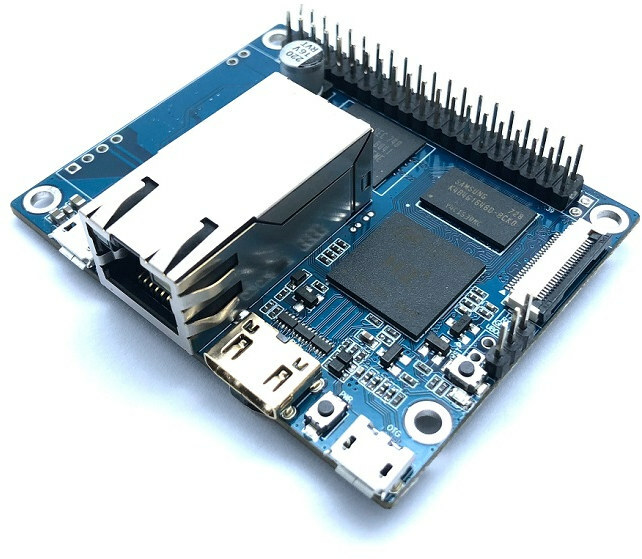 Allwinner H2+ quad core Cortex A7 processor has enabled some of the cheapest Arm Linux boards on the market with products such as NanoPi Duo or Orange Pi Zero with the latter now selling for about $9 and up. 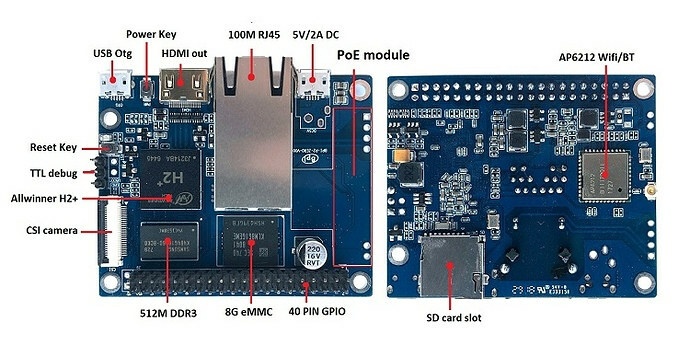 SinoVoIP also had their own inexpensive – and Raspberry Pi Zero compatible – Allwinner H2+ board with Banana Pi M2 Zero, and the company has now been working on another model dubbed BPI-P2 Zero which includes support for PoE (Power-over-Ethernet) as well as a CSI camera interface. SoC – Allwinner H2+ quad core Arm Cortex A7 processor with Mali-400MP GPU. System Memory – 512MB DDR3 SDRAM. As noted by the company BPI-P2 Zero has very similar features compared to the earlier BPI-M2 Zero, but is wider due to the addition of an 8GB eMMC flash, an Ethernet port, and PoE function. That also means software support will be similar with both Linux and Android supported as indicated in the Wiki. The presence of both PoE and an a camera interface means the board could be used for custom PoE IP cameras should could be connected to the network appliances like Lanner NVA-3000 machine vision computer that supports up to 8 PoE cameras. SinoVoIP does not sell the board on Aliexpress just yet (Update: Now launched for $16 and up see pinned comment below), but the company does offer the option to replace Allwinner H2+ with pin-to-pin compatible Allwinner H3 or H5 processor. – PoE module(s) optional or not? – Board and PoE module overpriced or not? – which kind of ‘PoE’? Passive? 802.3af? 802.3at? But as you say can anyone trust it? for BPI-P2 zero PCB size , we design a new PoE module for it , and will update all PoE spec at our wiki page . Fixing grammar? No please! Today it’s easy: open their wiki and search for ‘Hardware interfact’ (fact not face) on a device page. If there’s ‘interfact’ then you know they did not hire a technical writer but their funny copy&paste monkey is still active so you know right now you can’t trust in any ‘information’ there as in the past. It’s just a careless person doing copy&paste jobs with random words and numbers from somewhere else. Fortunately easy to spot. If it says with PoE i would expect it to be build in. The PoE module is not soldered on the photos they provided though. But anyway, whether it’s optional or not, it’s not an issue, as long as they make it clear once they start selling the board. It could well be, and that one appears to fit perfectly in the 6 through holes on BPI-P2 Zero board. The camera and encoding hardware on the H2 is very poor. I’d make another version with the same form factor but swap in the V3. I would point out that there are zero low cost V3 dev boards on the market. 8G flash is likely overkill with 512MB of RAM, drop it down to 4G. What about LicheePi Zero @ https://www.cnx-software.com/2017/03/10/6-licheepi-zero-arm-board-runs-mainline-linux-supports-lots-of-add-on-boards-crowdfunding/ ? That’s V3s with 64MB internal DRAM. The V3 supports up to 2GB external DDR2, DDR3, DDR3L, LPDDR2 or LPDDR3. I have a Lichee Pi Zero. The 64MB of RAM is a huge problem when you turn the camera support on since it consumes 32MB of RAM. The mechanicals of that board are awful. The SD Card is in the center of the board, not the side which is an absolute pain to keep taking the SD Card in/out. Plus I broke the microUSB power connector off after four days. More of a toy than a dev board. V3S is limited to 720P. The V3 can do 4K 20FPS. I also have a SC3806 (V3 dev board) but they cost over $200 each. I’d like to build a network of V3 cameras, like a dozen of so, but not at $200 each. V3 is $3.80, these boards should cost $20. There are millions of those Allwinner V3 based 4K GoPro knock off cameras around for $30. I tried taking one apart for dev board use but the PCB inside is double sided components hopelessly crammed together tightly. No visible UART access. Probably a six or eight layer board since it is 100% coated on both sides with components. Amazing what can be crammed into a 4sq in PCB – SOC, DRAM, Flash, EP92 (HDMI), SD Card, LCD, etc…. If someone makes a dev board, everyone is going to want the IMX179 sensor like the GoPro knockoffs use. With that sensor you can do 4K 20FPS with the V3. V3 is supported in mainline and it does work. It is missing a driver for the MIPI camera and the h.264 encoder. Those are supported in Allwinner’s Linux 3.4 for the chip. I would love it if those got ported into mainline. USB, network, display, etc all work. Note to get more than 1080P30 out of a camera you have to switch from CSI parallel to MIPI. There is insufficient bandwidth in the parallel interface. Be sure and mount the sensor on the PCB with a screw on mount. Cameras need IR cut and the flex cable modules don’t have it. That doesn’t make sense, the market is flooded with H2, H3, etc boards and there is nothing for the V3. Cameras are a key IOT device. This is actually not true, the LicheePi Zero is still a very real thing, the problem is being able to order in the US and EU, that said if you can reach the manufacturer directly he will work with you. In fact there is two new versions of the board available since first release the nano and a version with built on carrier board. I need to add the new images to my site but you can get an idea at https://licheepizero.us where I made an English page with links to the basic info and have the pictures of the original. I will reach out to the guy who makes the board and see if he wants to come provide contact info for ordering in the US and EU (currently only available on taobao). The main problem with the V3S is if you turn on camera support it uses half of the available RAM. That only leaves 32MB for everything else. I can probably fit production code into 32MB the problem is developing in 32MB. You waste a lot of time stripping everything down until it fits. Much easier to work in 256MB or 512MB on a V3 and then pack everything in the last step of development. I know some another famous SBC vendor making a S3/S3L board (V3 with 128MiB/64MiB copackaged DDR, in BGA package). With the permission, I can now disclosure who the vendor is. The goal is to bring an open source IP cam to the market, since there are none / not many. Icenowy must have a lot more info (and a sample), but she can’t say much :). Will the ISP and video encoded be opensource or be a blob? Because of the 3.4 blob for ISP it is impossible to get off from 3.4 kernel. The PoE module is being designed by SinoVoIP. Draft description is found @ http://sinovoip.com.cn/ecp_view.asp?id=537 . This is nice, even though it’s copied from another datasheet: https://www.makerfabs.com/desfile/files/RT9400_POE%20PD_SPEC_V4_3.pdf The company is called “Shenzhen Ring&Tone Electronic Technology”, and the datasheet is dated 2012. SinoVoIP design looks a little different though. This one has POE on board. http://www.virtualette.com/, but only A20. I wish all these sbc has a standard headers pin out signals- so we can build common hardware to plug into.